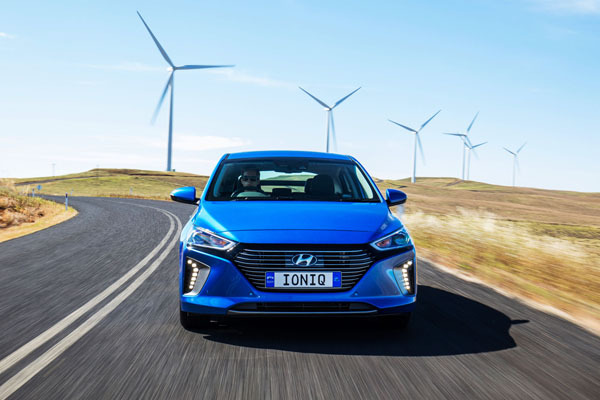 Hyundai’s electrically influenced Ioniq range is just about ready to go on sale in Australia. There are a few of them getting around, loaned to lucky fleet users, as the Korean company get a feel for what it’s real debut may herald. While colleagues have looked at performance, battery capacity and Hyundai’s really drive to stretch out, we were able to put this new looker to the family test. With its sleek lines, well-appointed front end and hatchback rear the Ioniq Hybrid makes quite a pretty picture. You can save the planet and look good too. It matters not that the really worthy exterior elements are more about achieving a fuel-saving aerodynamic shape than wanting to run with the cool kids. It is eye-catching, in a good way, and aside from the poor rear visibility, there is nothing to test the complaints department. The interior is much more demure than I was expecting. 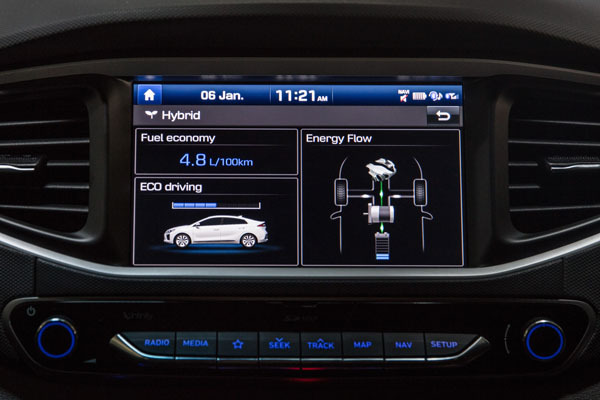 Aside from the energy-use instrumentation that shares space with the speedometer and the Eco climate change option, there is little to separate the Ioniq, visually at least, from a petrol guzzler. That could be a good thing, I suppose, but a little bit of flash design wouldn’t hurt either. The materials themselves are recycled or sustainably sourced and look and feel, for the most part, of approving quality. Lodgings are comfortable, both front and back, with seating comfortable without stretching to plush. The phone charging plate at the bottom of the centre stack is a useful touch although storage could be a tad better – a solitary front cup holder and shallow door pockets feels wanting. Even the environmentally-conscious have stuff. The sloping roof which may hinder taller passengers has no problems accommodating the kids. Two is a better number than three though as the centre seat is a touch hard. There are two IsoFix points should you have littlies. My girls loved the sunroof and the idea of travelling in a car powered in much the same way as their battery-operated toys – it’s a stretch, but parents embellish the truth, okay? – but did bemoan the lack of a USB point in the back. Surprisingly, the boot is practical, offering up 456-litres with the 60:40 rear seat in position. That will do you a fair grocery shop even with the school bags chucked in haphazardly and let’s not forget there is a full-sized spare in there too. An 8.0-inch split colour touchscreen is as adept as giving you the energy breakdown as it is in providing reliable directions. Graphic quality is great, as is connectivity, with the up-to-date traffic information saving valuable gridlock time too. The warnings of “children crossing ahead”, were alarming at first in the pitch dark but quickly became a slight annoyance along, as did the over-sensitive lane-keeping assist. There is Apple CarPlay and Android Auto if you are unable to be parted from the comforts of your smartphone screen and a decent eight-speaker stereo to listen to those tunes. 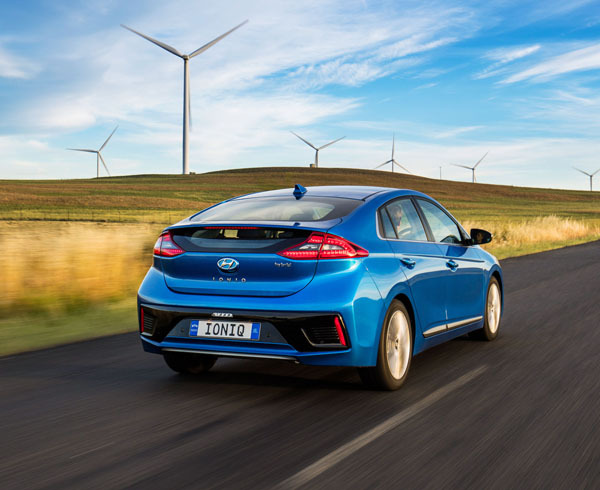 So the Ioniq Hybrid is powered by a 1.6-litre four-cylinder engine capable of 77kW of power and 147Nm of torque and a 32kW electric motor taking that output to 103kW and 265Nm. This is no speed demon of course but there is more than enough to get you around the city and along the open road too. Hyundai have opted for a six-speed dual-clutch transmission rather than a CVT. It is an efficient performer, helped not even a smidgen by almost incongruous paddle shifters. The Ioniq Hybrid Premium doesn’t have an ANCAP safety rating yet but it certainly doesn’t miss a beat with seven airbags, front and rear-parking sensors and a much-needed rear view camera. This variant also includes autonomous emergency braking with pedestrian detection, lane keep assist, blind spot monitoring, forward collision warning and rear cross-traffic alert. Hybrids or purely electric cars are always an interesting proposition. Giving the kids a final warning that they need to get in the car only for them to leave it until the engine is running before they blast out the door doesn’t work here, because there is deathly quiet when you turn the key. That silence can be quite eerie actually, even more so for the pedestrians that don’t hear you alongside. By and large, however, the Ioniq Hybrid is a comfortable, easy drive with the car itself simple to get accustomed to and its little idiosyncrasies gentle enough to live with. Performance is a combination of electric and petrol and you have little choice as to which medium will engage, the pressure of your foot on the accelerator the only indicator really of whether the Ioniq will answer with a growl. You can’t select electricity-only mode, but one kicks in at really low speeds or when reversing or gently coasting along, it won’t stay that way unless you are super light on the throttle. Energy from braking is stored to recharge the battery and it won’t be long before you become enthralled in the game of trying to fill as many bars on the battery indicator as possible. Hyundai Ioniq feels settled thanks to its Australian suspension and steering tuning. It is quick to adapt, easy to manoeuvre despite a light steering. While it may hint at a sluggish nature, it will not leave you in the lurch should a burst of speed be needed. It will go willingly into quick corners without really relishing the experience, needs definite direction if you want it to stop quickly and can be a touch loud on some road surfaces. Fuel consumption is a claimed 3.2L/100km and we stayed around 4.0L/100km during our week which is pretty amazing. 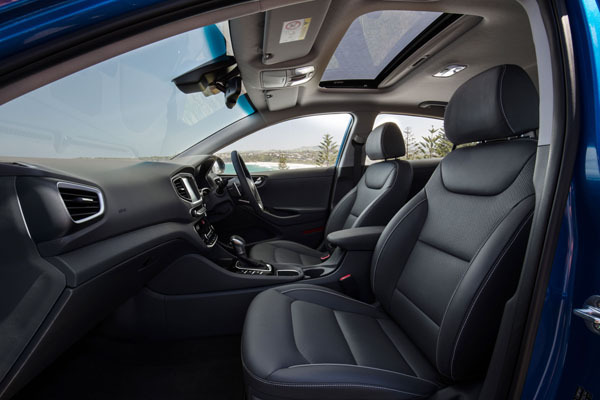 The Ioniq Hybrid lacks for nothing in the equipment stakes which is a boon for families with a features list that includes sat-nav, dual-zone climate control, auto headlights and wipers and heated and cooled seats. This hybrid is backed by a five-year unlimited kilometres warranty and will also likely be a part of the capped-price servicing program. Hyundai’s Ioniq Hybrid is sure to make waves. When the plug-in hybrid and pure electric models arrive, this mighty Ioniq triumvirate will give the Korean manufacturer yet another string in its bow. The Ioniq helps demystify electric-powered cars making them ordinary enough to be popular. It allows people to go about their day in a sensible, well-equipped, good-looking car while doing their bit for the planet. Who can argue with that? Petrol output: 77kW at 5700rpm and 147Nm at 4000rpm.